on weekends + after 5pm Mon.-Fri.
CARNEGIE MELLON UNIVERSITY supports the creation, understanding and growth of contemporary art through exhibitions, projects, lectures, events and publications. The gallery aspires to engage diverse audiences and to create and strengthen communities through art and ideas. 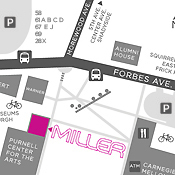 The Miller Gallery was founded in 2000 by Regina Gouger Miller, artist, educator, businesswoman, arts patron and alumna of Carnegie Mellon's School of Art. A unit of the College of Fine Arts, the three-story, 9,000 square foot space is free and open to the public and located in Pittsburgh, Pennsylvania. If you've visited our exhibitions or attended one of our events, please consider supporting us. The Miller Gallery at Carnegie Mellon University is participating in this year's PITTSBURGH IS ART: Day of Giving, a campaign for the region's thriving arts and culture organizations. Any donation of $15 or more made during these 24 hours will have an even greater impact with additional funds from a match pool. 3.) Under Nonprofit Selection, choose "Miller Gallery at CMU College of Fine Arts" from the dropdown menu. Thanks for supporting The Miller Gallery + helping to keep our admission free of charge!